This Thai pumpkin soup is a soothing comfort food when the weather turns colder. Squash may be substituted for pumpkin, and other vegetables may be added if you want it even healthier. Anyway, you cook it, you'll have your guests asking for second helpings of this delicious, nutritious Thai soup. 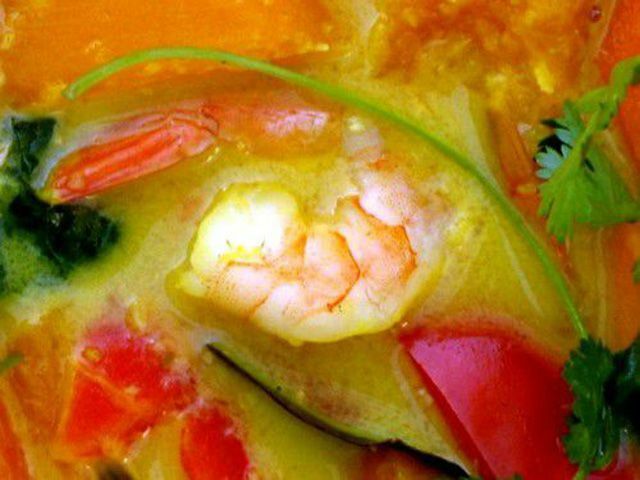 Richly colorful and aromatic, this soup is excellent during the fall and winter months when the lemongrass will benefit your immune system and help keep away those nasty flu bugs. Enjoy! Place stock in a large soup pot over high heat. Add lemongrass, lime leaves, garlic, shallot, galangal or ginger. Boil 1 minute. Add pumpkin or squash and sweet potato. Bring to a boil, then lower heat to medium-high, simmering for 5 to 8 minutes, or until these vegetables are soft enough to pierce with a fork. While simmering, add all the other 'flavorings': chili powder, ground coriander and cumin, fish sauce, shrimp paste, turmeric, brown sugar, lime juice, and chili. Now add the prawns and bok choy. Cover and cook for an additional 3 minutes, or until prawns are pink and plump. Reduce heat to low and add the coconut milk, stirring to combine (add up to 1/2 can for very creamy, coconut-flavored soup). Taste-test the soup, adding more fish sauce if not salty enough (note that the saltiness of your soup will depend on how salty your stock was to start with). If too sour for your taste, add a little more brown sugar. If too salty or sweet, add more lime juice. If too spicy, add more coconut milk. Ladle into bowls and serve hot with fresh coriander sprinkled over. This soup may also be served with cooked rice or noodles for a nutritionally-balanced meal. Enjoy!